Tandem skydive over beautiful Rottnest Island with Skydive Geronimo and same day return ex Fremantle Adult Ferry Ticket with Sealink Rottnest. 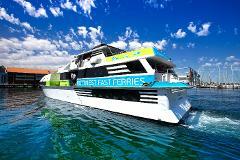 Departs B-Shed Fremantle - 9:10am Departs Rottnest Island - 4:00pm. Tandem skydive over beautiful Rottnest Island with Skydive Geronimo and same day return ex Hillarys Adult Ferry Ticket with Rottnest Fast Ferries. Departs Hillarys Boat Harbour - 7:30am Departs Rottnest Island - 4:30pm. WINTER DEAL: JUMP BETWEEN 1ST JUNE 2019 AND 31ST AUGUST 2019 Tandem skydive over beautiful Rottnest Island with Skydive Geronimo and same day return ex Fremantle Adult Ferry Ticket with Rottnest Express. WINTER DEAL: JUMP BETWEEN 1ST JUNE 2019 AND 31ST AUGUST 2019. Tandem skydive over beautiful Rottnest Island with Skydive Geronimo and same day return ex Fremantle Adult Ferry Ticket with Sealink Rottnest. WINTER DEAL: JUMP BETWEEN 1ST JUNE 2019 AND 31ST AUGUST 2019 Tandem skydive over beautiful Rottnest Island with Skydive Geronimo and same day return ex Hillarys Adult Ferry Ticket with Rottnest Fast Ferries. WINTER DEAL: JUMP BETWEEN 1ST JUNE 2019 AND 31ST AUGUST 2019 Tandem skydive over beautiful Rottnest Island with Skydive Geronimo and same day return ex Barrack St (Perth) Adult Ferry Ticket with Rottnest Express.